Okay I'll take a stab here though I know it's probably useless to try prying one of these away from you. I have a pretty substantial Creature collection. Not as great as others here, but I can fill an entire bookshelf with Creech, so not bad. One of the items I'm craving is a Mexican blowmold Creature. Once upon a time, I had no $ and would see them on evilBay frequently. Now I have a little spending money and they have disappeared. Anyone looking to part with one? My best (if obvious) advice, is save your pennies and keep an eye on eBay. You're likely to have better luck offering a dollar amount. It's not many, if any, who find "a little" enticing. I'd love t see photos of yor collection, btw. Big Creature fan myself. I'd love t see photos of yor collection, btw. By a "little spending money" I am being somewhat vague. 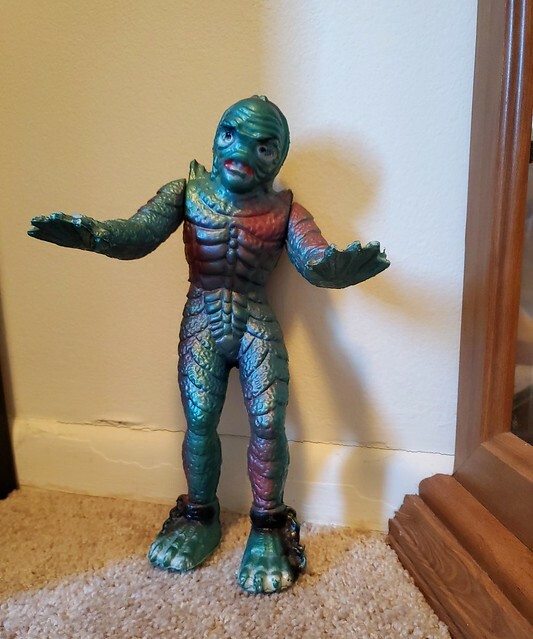 I have literally looked at every new Creech post on Ebay for well over two years now.... every day .... every toy. I'm familiar with prices and know what the last few blowmolds sold for on Ebay. I'm willing to spend that plus some. The last two I'm aware of were $300 and $80 respectively, which is part of why I ask. At $300 plus, I think you'll find one. You could also post this in the "Latest Gets" thread. In the lower right of the page is a bent arrow. Click on it and copy the highlighted url and paste it into your message.